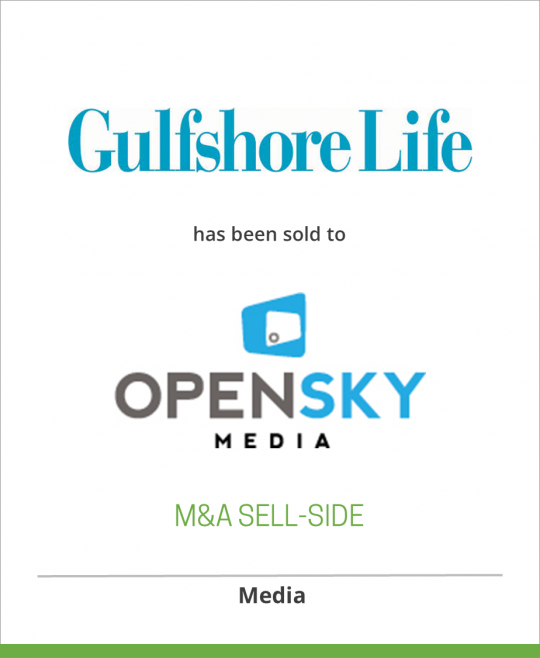 DeSilva+Phillips announces that Naples-based Gulfshore Life and Gulfshore Business magazines and other affiliated titles were acquired by Open Sky Media, Inc., a Texas-based publisher of city magazines in Austin, San Antonio, Oklahoma City, and Marin County, CA. Financial terms of the transaction were not disclosed. In addition to monthlies Gulfshore Life and Gulfshore Business, the company publishes annual magazines including Gulfshore Life At Home, Forever Young and Southwest Florida Guide to the Arts, and custom publications for local organizations such as Naples Community Hospital and the Greater Naples Chamber of Commerce. The Gulfshore division will be the largest of Open Sky Media’s five regional offices. All Naples-based staff and management will continue with the new company, said Franks. Dan Denton, president of Gulfshore Media LLC and a Naples resident since 2002, will remain as executive publisher for several months before returning to Sarasota, where his company publishes Sarasota Magazine and other titles.